Ninety three-year-old Mr. Williams at Alice’s Garden, directing the planting of peanuts in his “Forever Garden” plot. Chef and food scholar Scott Barton and artist-in-residence Portia Cobb continue their joint exploration of Diaspora legacies through food and foodways in a weekend of activities related to Eliza’s Peculiar Cabinet of Curiosities and Lizzie’s Garden. In Barton’s first mini-residency, they will engage a small group of elders in discussions about land, gardening, migration, and food. Together they will share recipes, prepare foods, and preserve vegetables from Lizzie’s Garden (okra pickles, canned collard greens, chow-chow—or whatever is in season). Some of these activities will be open to the public (see below), and will provide opportunities for talking, tasting, and watching food demos. Others will be documented in videos that will be shared at a future date. Chef and food scholar Scott Barton and artist-in-residence Portia Cobb talk story about the land and Lizzie by taking you on a tour of Lizzie’s Garden and Eliza’s Peculiar Cabinet of Curiosities. Then, joined by local elders on the porch of the cabinet, Cobb and Barton lead an informal discussion about gardening, migration, and Diaspora legacies through food/foodways. Stop by before Kavon Cortez Jones’s Performance on the Porch to taste the fruits of the day’s preserving and share stories about food and foodways. 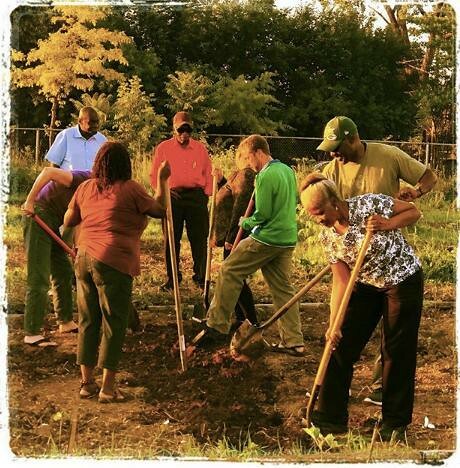 Bring your recipes and food traditions for okra, cabbage, collard greens, tomato, cucumber, cowpeas, peppers, herbs, sweet potato, or peanuts (goobers)—the vegetables growing in Lizzie’s Garden. Scott Barton demonstrates a preserving technique for vegetables from Lizzie’s Garden. Taste, talk, share stories and recipes for okra, cabbage, collard greens, tomato, cucumber, cowpeas, peppers, herbs, sweet potato, or peanuts (goobers)—the vegetables growing in Lizzie’s Garden.